It’s Thursday Three-For-All time here at Flint Club. Genesee Towers has been in the news very recently, for obvious reasons, so we thought we would have a Genesee Towers specific three things this week. 1. Genesee Towers was started in 1966 and finished in 1968. 2. The Towers have 10 floors of office space totalling 172,000 square feet. 3. With the parking garage included, as well as the lobby, there are 19 total floors, and the building stands 250 feet tall. Now you know, if you didn’t already. Flint has the building, what do you think should be done with it? It’s Wednesday, and time to find out what is happening this weekend in and around Flint. -The FIA will be kicking off Hispanic Heritage Month this weekend with the movie Only When I Dance. Friday and Saturday at 7:30pm, Sunday at 2pm. -The Flint Folk Music Society will be hosting Bill Staines Concert at the GFAC this Friday at 7:30pm. -There will be an Arabesque Classical Music Concert at Mott Community College on Friday at 6:30pm. -The Good Beans Cafe will be hosting the production of Forest for the Trees this Friday and Saturday at 8pm. -The Flint Symphony Orchestra will be performing its first classical concert of the season this Saturday at 8pm, at The Whiting. -The 2010 Greater Flint AIDS Walk will be this Saturday on the UMF campus. Registration begins at noon, with the walk to start at 2:00pm. -The Genesee County Committee For Community Peace will be hosting a celebration of Peace Day this Saturday, with the installation of a statue of Mahatma Gandhiji on the UMF Campus, Wilson Park. There will be a peace march from City Hall beginning at 9:15am with the statue dedication at 10:00am. And that is What’s Up this weekend in Flint. Hello out there Flint residents and non-residents. Your faithful Flint Club blogger was gone last week, but is back this week and ready for another fun week of Flint trivia, happenings, photo contests and the like. -There was no Foto Contest this past Friday, but we did not announce the winner from the Friday before, so we still have congratulations to give. Congratulations to Flint Club member Jodie Wright, she was able to guess the correct location and is the winner of a snazzy Flint Club T-shirt. -Did anyone make the Art on Tap at the FIA this weekend? It seemed to be a great success, the Flint Journal reported that 500 or so people went to the event. -Speaking of events, did anyone make it downtown to the 4th annual Bikes on the Bricks? That seemed to be well attended as well. It is fantastic to see so many people enjoying Flint weekend after weekend. -Did you get your car washed by a zombie this weekend? No! Well it seems zombies were spotted in The White Horse parking lot on Saturday from about noon to 3 washing cars. Is it Friday already? Yes? Ok, time for the Friday Foto Contest! For those of you that live here you probably see this landmark once or twice a week. For those of you that used to live here, we think you probably saw it while in Flint. But the real question is, where is it? For this contest you will need to name the cross streets where this sign sits. So the right answer will be “Oh, way too easy, it is on the corner of ________ and ________. So take your best guess. The first person to answer correctly in the comment section of this post will win an awesome Flint Club t-shirt. 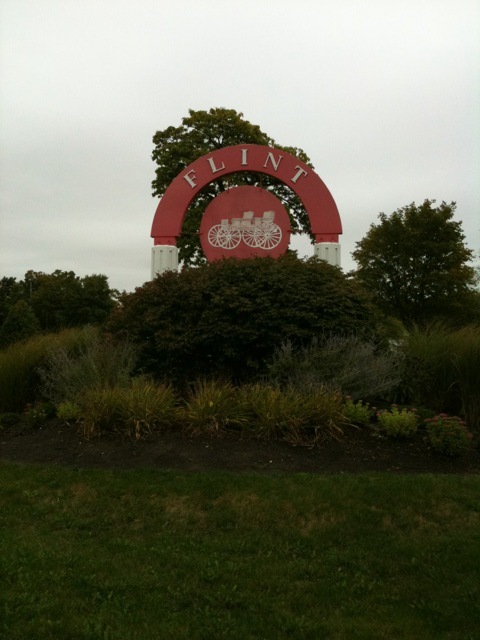 What’s Up Wednesday time here at Flint Club so let’s take a look at what is happening in Flint this weekend. -The Girl Who Played With Fire is showing at the FIA this weekend. It seems like everyone has read this book, now you can see the film. Friday and Saturday at 7:30pm, and Sunday at 2:00pm. -The “Basic Drawing” exhibition is up at MCC, in the Fine Arts Gallery. It is free to attend, so go check it out on Friday from 9:00am-4:30pm. -Vertigo Theatrics will be presenting the musical “Working” this weekend at the Masonic Temple. Friday & Saturday dinner starts at 7:00pm with the show at 8:00pm, and Sunday lunch at 1:30pm and the show at 2:30pm. -The Fox 66 Bringing It Home Fall Festival is this Saturday from noon to 6:00pm at the Perani Arena & Event Center. -The play “Paid Programing” will be at Buckham Gallery this weekend Friday and Saturday at 7:30pm and Sunday at 2:00pm. And that is what is happening this weekend.